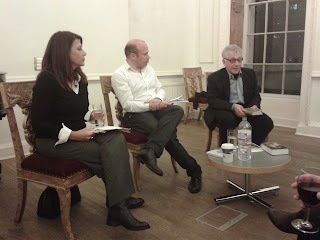 From left to right: Katherine Dovlatov, A.D. Miller and Zinovy Zinik at Pushkin House last night, celebrating the launch of Katherine Dovlatov's translation of Pushkin Hills, written by her father Sergei Dovlatov and available now for the first time in English. It was a wonderful occupation - absorbing and informative - and well attended, thank you to Pushkin House for hosting the event and to the three panelists for their insightful discussion. We welcome your comments, feel free to leave a message below.